Early winter in Utah is a magical time, as the first few hundred of inches of fluffy snow begin to pile up on the slopes in the Wasatch and powder days become a top priority. Oft forgotten, however, are the canyoneering adventures the southern part of the state continues to offer. While the days are certainly shorter and morning starts colder, there are several advantages to “going underground” this time of year. I’m particularly fond of not sweating away half my body’s weight on approach hikes, only to be near hypothermic once in the canyon, before returning to a scalding hot exit hike. Winter canyoneering in dry canyons, meaning no more than ankle deep water, allows for a more temperature-controlled and enjoyable experience. A bit of additional preparation and equipment—plus thorough research on canyon selection and condition—can make winter canyoneering rival summer adventures. Once you have a canyon or area in mind, checking the upcoming weather is as important as checking the past as well, in order to gauge whether or not the canyon will be dry. I try to keep tabs on the last month’s worth of precipitation and use online resources such as climbutah.com and the ACA Message Boards for recent trip reports and local knowledge/beta. This is helpful for the canyon itself, but also for the rough roads usually required to drive to a canyon’s start. Looking beyond rainfall amount is imperative: snow and ice can encase anchors and make rappel ledges dangerously slippery. If average daily temps haven’t been well above freezing, I’ll look elsewhere to a different canyon system. I’ll also read through the route description and topo to see where more than ankle deep water could be, plus its relation to the first rappel, in case I need to pull the proverbial ripcord and retreat. Even though I plan to stay dry, layering and alternate clothing is key to staying warm. The most important article of clothing I pack is a winter hat that fits under my helmet. Since a warm head is a happy head, a hat is this bald guy’s best friend. Going from head to toe, I also bring several extra pairs of socks, including a set of neoprene socks for sections of shallow, standing water. Depending on how much water I expect to encounter, I may pack a second pair of shoes and designate one pair to wear through water and the other for a dry hike out. Switching shoes, coiling ropes, adding or removing a hat slows the pace down a bit, which can drop body temps very quickly—sometimes less than a minute. For stops of more than 60 seconds, I keep an oversized, but not bulky, puffy coat at the top of my pack. 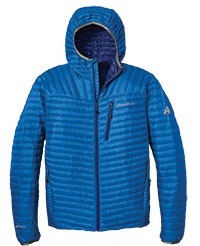 I like the Eddie Bauer First Ascent StormDown because it’s highly compressible and has a hood. ($199 eddiebauer.com) The first thing I do when I stop is throw this blanket of feathery goodness on to stay toasty warm while messing with gear or shoes. Walking with your hands in your pockets comes at the cost of balance and reaction time: I have more than one trip and fall to prove it. A thin pair of leather gloves works well for both rappelling and keeping my digits warm walking through the canyon. Eating is another important combatant of cold. Similar to feeding a fire with additional pieces of wood before it starts to lose its strength, our bodies work the same way. In addition to snacks I pack two thermoses. One is for coffee, the other for piping hot tomato soup. 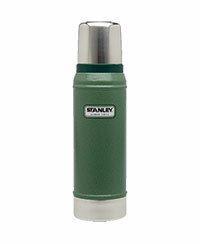 Coffee is a diuretic and could make you colder, but in my opinion a few warm sips here and there from my Stanley Vacuum Bottle ($38 stanley-pmi.com) over the course of a day keep the cold at bay. Not having to haul a wetsuit or drysuit in your pack allows for an extra margin of safety items in their place. Normal safety protocol for canyoneering is to bring three times the length of rope as the longest rappel expected, in case of a stuck rope or rescue situation. This extra rope can also come in handy for swapping rappels. Ideally, I like to be in a group of four and split into two teams, which allows one team to swing ahead and work on setting up the next rap while the tail group is pulling and coiling ropes from the previous drop. The first extra things I pack are mechanical ascenders, such as the Black Diamond NFORCE ($79 blackdiamondequipment.com). In summer, I opt for a tibloc or some simple prussiks in case I need to make an emergency ascent of a rope. In winter, however, I like to leave the rope strung from the first rappel and explore downcanyon to the second rap to confirm the potential water condition is as expected. If I see more than just puddles around the next bend or over the next drop I can use mechanical ascenders to retreat, which is far more pleasurable than using just cord. Bringing a headlamp should go without saying, and I double and triple check it works and the batteries are fully charged. I also carry an extra set of fresh, dry batteries in my pack. One of my favorite winter descents is Birch Hollow, on the eastern environs of Zion National Park. 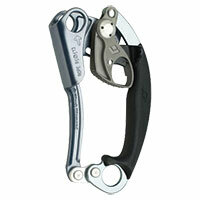 This sinewy slot serves up some long, fluted, rappels and can easily be completed in the shorter daylight hours. There may be a trickle of water in the slot, but nothing more than ankle deep, thought the same cannot always be said for the miles of dirt (read: frozen mud) road approach drive. Other areas that don’t swell with icy cold water in normal years are in the San Rafael, some of the slots in Grand Staircase, and north of Lake Powell. What I typically look for is a canyon with an “A” rating, as far as its normal water condition. A rated canyons are typically dry, with not much more than shallow, standing water. Anything more than that and serious cold water protection—such as a dry suit—is the only way to go.